Patients under assessment for colon cancer can now avoid having to have an endoscopy and can have a simple stool sample test instead. The test is being introduced by the Pathology Department at Worcestershire Royal Hospital meaning around 2,400 patients won’t need an endoscopy – saving the hospital thousands of pounds each year. An endoscopy costs the NHS £406 and the analysis of a stool sample costs £25 per patient. 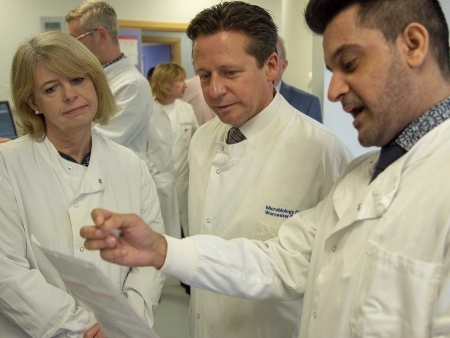 West Worcestershire MP Harriett Baldwin was briefed on the new test during a visit to the Pathology Department with her colleague Nigel Huddleston MP. Harriett commented: “It was really interesting to visit the Path Lab and see some of the amazing work that is going on to help get the best possible outcomes for local patients. Photo: Harriett Baldwin MP, Nigel Huddleston MP take a tour of Worcestershire Royal Hospital’s Path Lab with Camran Khan, Blood Bank Manager.